This module is not for sale anymore. Support will be provided for old buyers until another major dolphin version release. 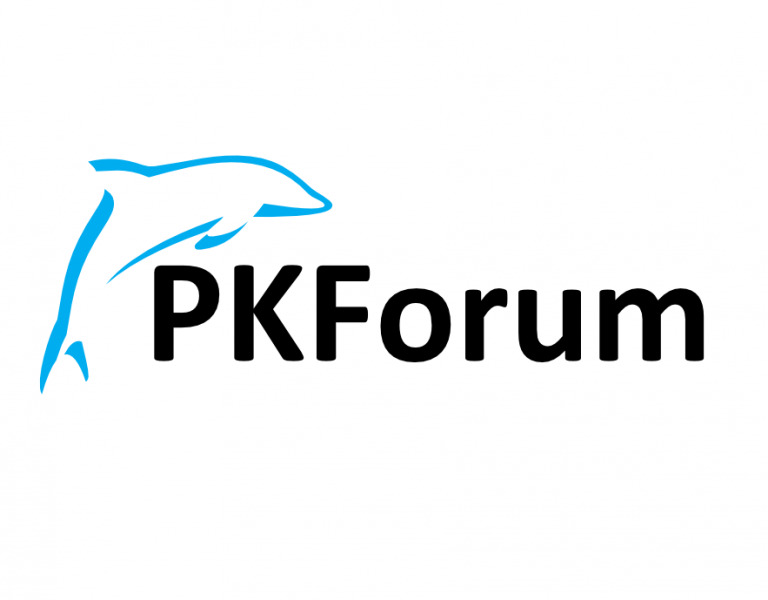 PKForum is an advanced Dolphin forum module that can be used either in place of, or in addition to, the default BoonEx "Orca" forum module that's included in the Dolphin 7.1.x and 7.2.x installations. members can add and edit their own topics and posts with either a plain or rich text editor, i.e. TinyMCE. TinyMCE provides a variety of content-formating tools, including options to add images, links and emoticons. 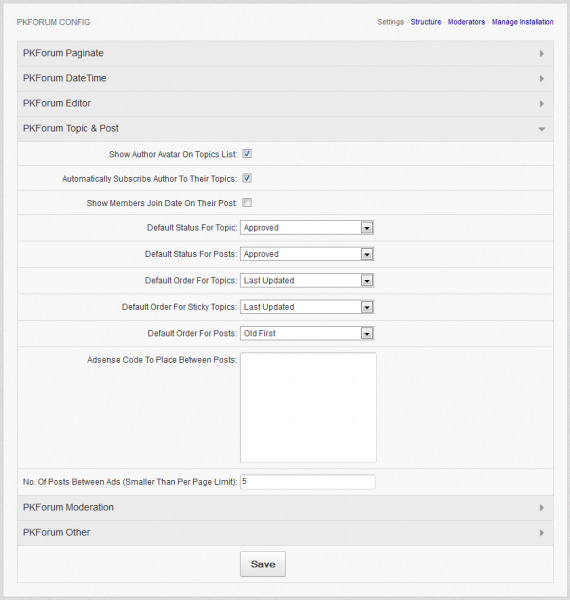 members can add/remove multiple file attachments to their posts (file-size upload limit is set in server settings). the Quick Reply tool can be used to quickly add a "text-only" post, i.e. without opening the TinyMCE editor. when posting in a topic thread, members can choose to quote some (with editing) or all of another post. a quoted-reply post may include nested-quoted-replies; each nested-quote will be indented to separate them. members may also delete their own topics and posts... removing the info from the PKForum database tables. members (and if allowed, guests) may reply and download attached files... unless the post has been locked. for each quoted-reply, including nested-quotes, the "Quote from" heading links back to the original post. included with each post will be some author information, e.g. avatar, username, join date and membership type. site moderators are noted as such in their post-author information (in place of the membership type name). members may customize their post "signature" beyond just text by using HTML code for images with links. there is also a Permalink tool that can be used to obtain a URL address directly to the post within the topic. members may share any post, via ShareThis, using their email, Facebook, Tweeter and/or LinkedIn accounts. site members may Subscribe to topics of interest to recieve update notifications when new posts are added. members can view their list of topic subscriptions and unsubscribe from ones they're no longer interested in. members (and possibly non-members, depending on admin settings) can Report "bad" posts to moderators. as an alternative to reporting a post, a member can "bury" an irratating post, which removes it from their view. members can search for a word or phrase in post subject and/or content... in one or more selected forums. 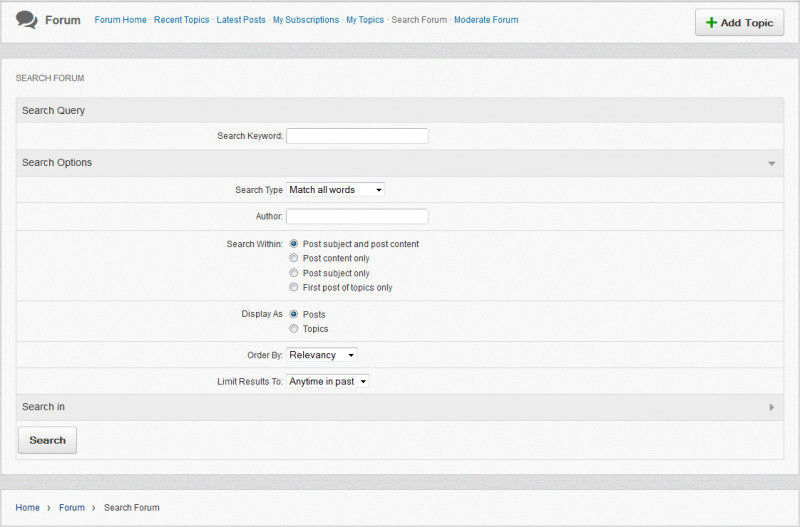 the forum search can further be limited to a specified author and for a recent period of time, e.g. last 7 days. 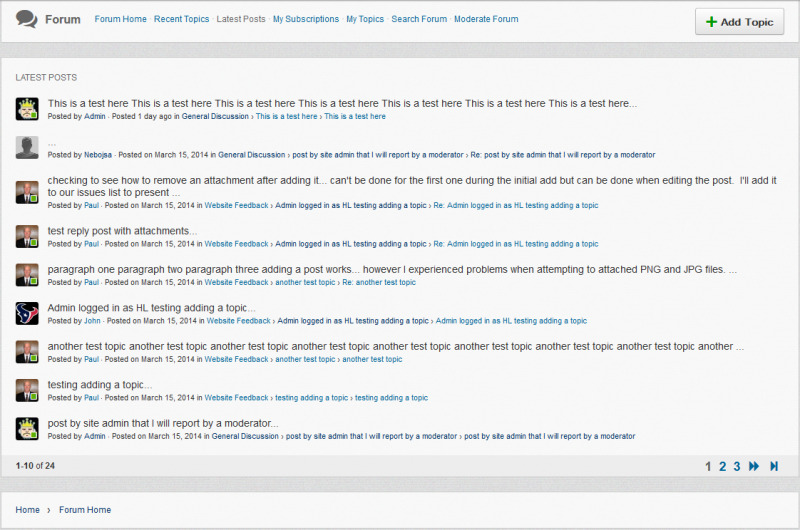 the forum results can then be displayed as either a list of individual posts... or just the related topic titles. a "noteboard thumb pin" icon will be displayed to the left of all Sticky topic titles, which are listed first. a "lightening bolt" icon will be displayed to the left of any Topic title that the member has yet to open. members may check the site's homepage to view changes in Recent Topics and/or Latest Posts listings. members may also check for forum-related changes in the SPY, Timeline and Site Stats blocks. The layout for the following PKForum pages can be edited: Forum Home, Add Topic, Recent Topics, Move Topic, Split Topic, Post Reply, Edit Post, Posts Feed (i.e. Latest Posts), Search, Moderate, My Subscriptions, and My Topics. 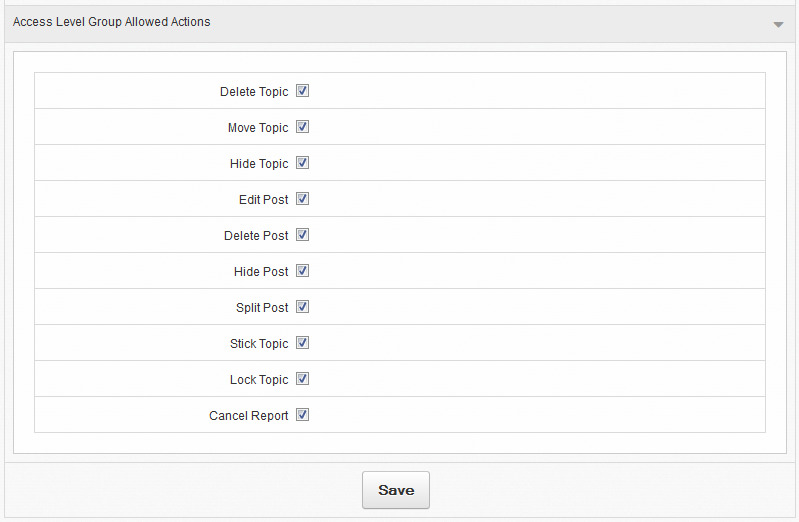 Admins can also add a Recent Topics or Latest Posts block to any Page Builder page by adding a new PHP block (e.g. with Deanos Tools) and one line of PHP code that can be found in the PKForum online manual. you can set the number of topics or posts that will be listed on various pages, or blocks, before pagination links are added under the list. Note: this is not one universal setting but several settings for various types or location of listings, e.g. Recent Topics, Latest Posts, search results, moderation listings. you can either enable or disable pagination on the Latest Posts listing, e.g. disable so only a set number can be viewed. you can decide whether to display the exact date, the time since the post was added, or a combination of showing the time since the post was added for only the first 48 hrs then showing the exact date thereafter. you can specify how the display of date and time will be formated (using PHP date parameters). 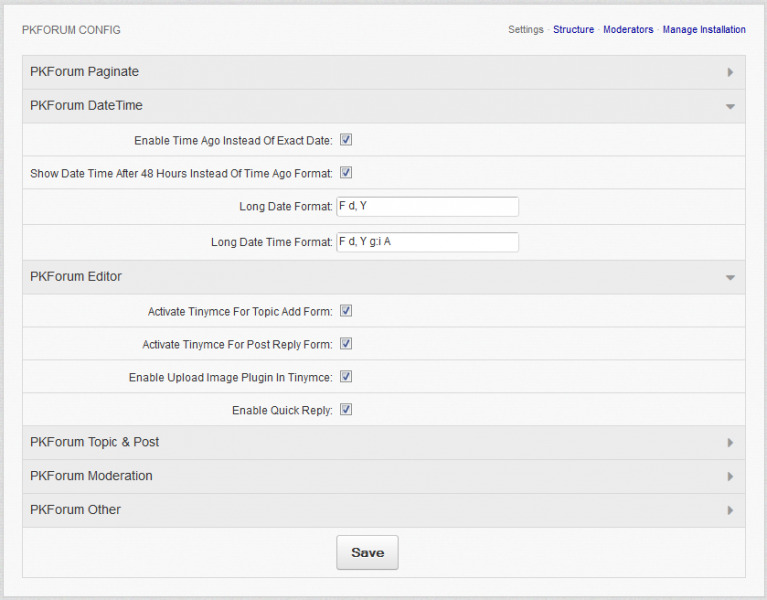 you can separately enable/disable the TinyMCE editor for adding content-rich Topics or Posts. within the TinyMCE editor, you can futher choose to enable a free addon upload-image plugin. there is also an option for a "Quick Reply" tool that, when enabled, adds a text-only reply area located at the bottom of each topic thread. there's an option for displaying each author's avatar next to topics they've added. you can choose whether to automatically subscribed authors to their own topics. you can display the member's site join-date as part of their post "profile" info. you may set new topics and/or posts to hidden until a forum moderator has approved them. it's your choice whether the order for topics is listed with either newest, oldest or last updated at the top. you can also decide the default list order with post listing, with either newest or oldest first. sticky topics are grouped at the top of topic listings and can be ordered with either newest, oldest, last updated, when made sticky, or alphabetical at the top of the list. you can also include Google Adsense advertisements within topic discussions... you decide how often. you choose how many issues can be include in the email, e.g. up to five recent issues. you also set how often moderation notifications can be sent, e.g. once per day. you decide whether to update a topic's URL (web address) if the topic title is revised. 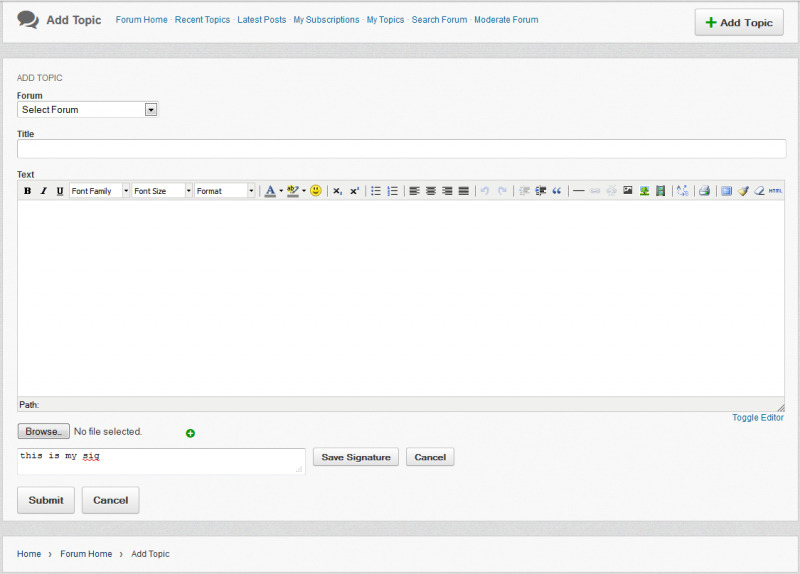 there is an option to make the forum template responsiveness (if your site template is). you can revise the default list of allowable attachment types that can be uploaded. you can allow non-members to report inappropriate posts in the "public" forums. you have the choice whether to use the auto-refresh feature on the Latest Posts block. you can add a "Share" link to posts by enabling and adding a free ShareThis publisher key. 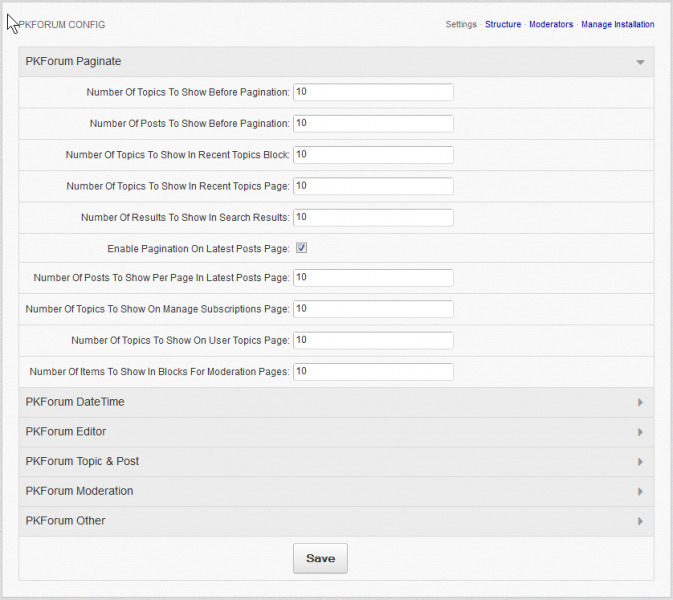 you can create custom forums and organize them into custom categories. you will find it's easy to move/reorder categories and forums using drag n' drop. while a member is adding a new forum-topic, you can display expected guidelines for that forum. 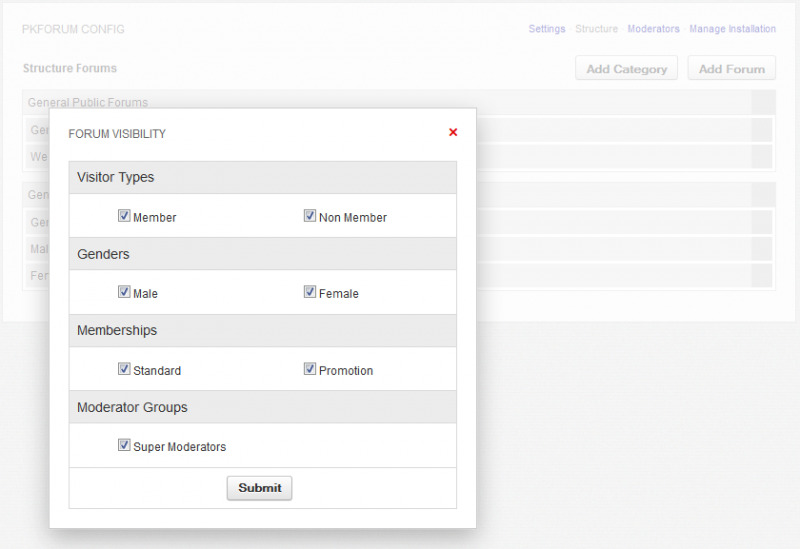 there are visibility (access) settings for each forum based on gender and membership. you can also set the visibility such that only moderators and admins have access. you can create a "Super Moderator" group that looks after all forums. 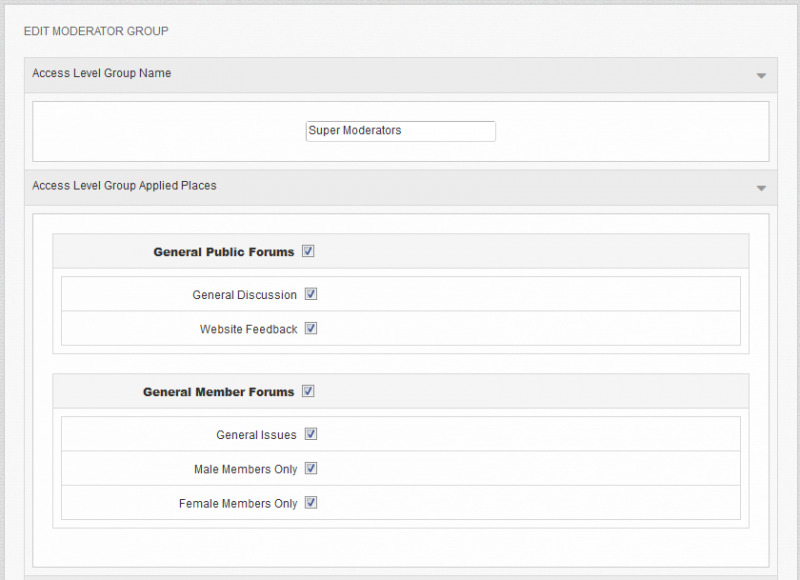 you can also create specialized moderator groups to oversee select forums. for topics - delete, move, hide & unhide, lock & unlock, make sticky & unstick. for posts - edit, delete, hide & unhide, split posts, and cancel reports. when splitting a post (i.e. moving it to a new topic), moderators can also move all subsequent posts. 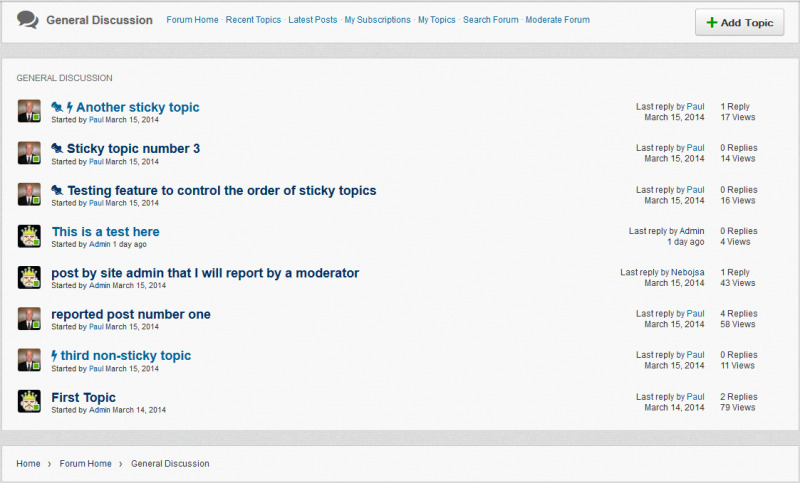 moderators have a Moderate Forum area showing: hidden and pending topics, plus hidden and reported posts. moderators have a "forum icon" in their bottom menu bar that warns whenever there are new moderation issues. moderators can access a "log" that stores moderation changes, such as when a topic was approved or moved. there is also a place for moderators to leave temporary notes for other forum moderators (and admins). 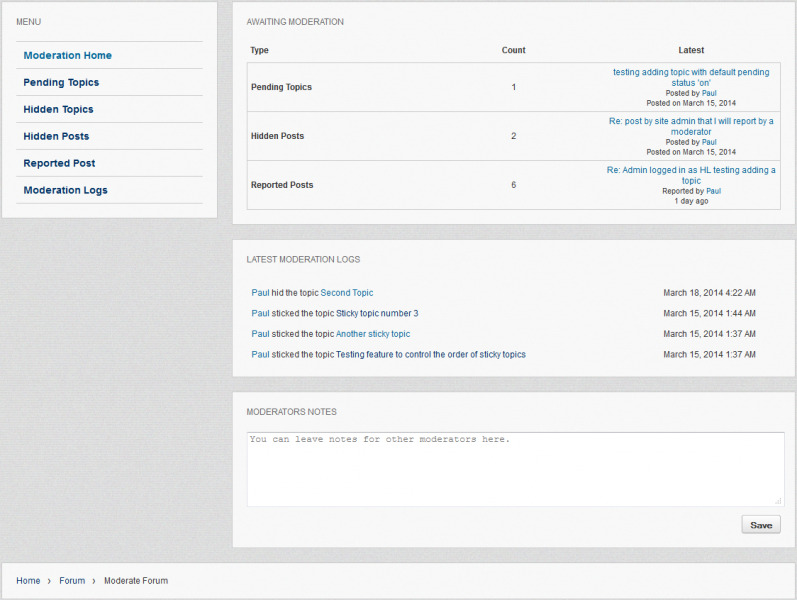 site admins will have full access to moderate all forums with all available moderation tools. each PKForum license you purchase will be distinct and monitored to ensure it's only used with one domain name. DolphinHelp provides online license verification and activation tools through a cloud server with high availability. our DolphinHelp Management Panel provides you with options to control where your licenses are used. due to PHP settings, the save/export feature will not work on Dolphin sites using "shared" hosting. the exported db file will not contain info found in the "Settings" section of the PKForum admin area (since that info is stored in a common Dolphin table). The workaround is either take screenshots of your PKF Settings or create some written notes that you can reference later. 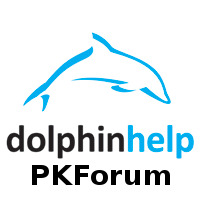 you can safely import a previously exported PKForum database into a fresh install or to replace the current PKForum database (this has been thoroughly tested for the Dolphin 7.1.4 platform with PKForum version 1.0). 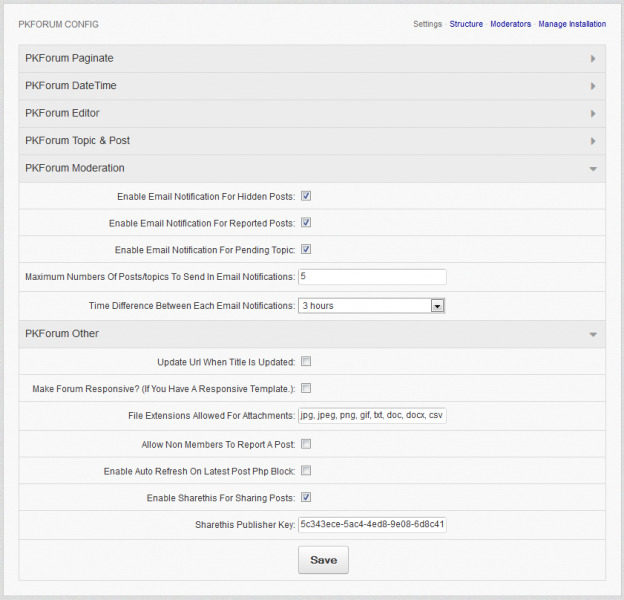 there is also a separate admin-only Orca-to-PKForum migration tool that can be uploaded to your website allowing admins to copy their Orca forum content into PKForum. an admin manual, complete with images and feature descriptions, is available on the dolphinhelp.com website. final note, since we designed PKForum for easy installation, we do not offer a free module installation service. However, for busy site owners looking for both installation and Orca migration, we do offer a paid service that includes backing up your site's database (to your server), installing the PKForum module, setting up the license verification, migrating your current Orca forum content, and either hiding or removing of the Orca module. Note: when purchasing more than one license, order from dolphinhelp.com to receive a multi-license discount. This is one of the most highly anticipated modules for me! Thanks Dolphin Help, finally a forum to be proud of, and easy to use too. Now I can take my site to the next level! FIRST, you need to install Dolphin. SECOND, you need to install PKFORUM. What a tremendous piece of work and worth far more than they are charging here. The Fish Forum was terrible, always has been. THIS product solves that problem! Massively outstanding work. Excellent! Admin only posting in individual forums. Super product! Best Part of this is the prompt support! Paul and Prashank are REAL!